If you’re in the service industry or are planning to get a job in the service industry and will be serving or selling alcohol, we can guarantee you’ll be checking a whole lotta IDs while on duty! In fact, one of the most important duties you’ll have while on the clock is to ensure you are checking those IDs properly! Knowledge is key here! Signing up for a MAST Certification Training is one of the best (and easiest) ways you can learn how to properly check an ID, not to mention the WA MAST Permit training also teaches you several additional skills which are incredibly beneficial and applicable to your role! The purpose of properly checking an ID is three-fold. It helps you to make sure the ID is valid (not expired – because expired IDs are not valid proof of identification for the purpose of obtaining alcohol), that the ID does indeed belong to the customer who handed you the ID (this confirms that the customer isn’t using someone else’s ID to try to obtain alcohol), and confirms the customer is 21 years of age or older and can therefore legally purchase and possess alcohol in Washington State. You’re probably already aware that every state has its own Driver’s License with its very own security features (this sure complicates things, doesn’t it?! ), but if you are serving or selling alcohol in Washington State it is likely most of your customers will hand you a Washington State Driver’s Licenses upon being asked. What is the best way to check a Washington State Driver’s License? As soon as a customer hands you their ID, there are 10 things we recommend you look for in order to ensure it is properly checked before serving or selling them alcohol. 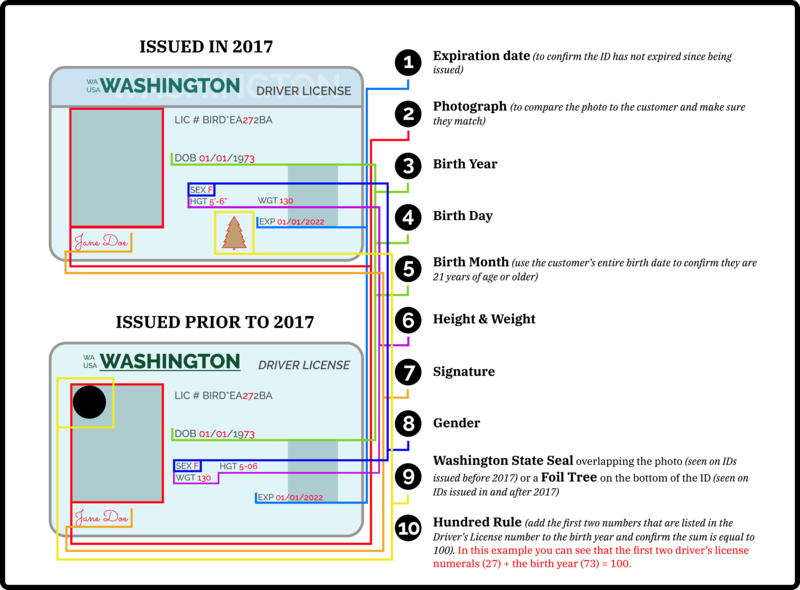 *Note: These are visual representations of the Washington State Driver's License meant to help you visualize where you *should* find the information discussed in this article. These are only partial representations and do not include all of the information you will find on an actual Washington State Driver's License. Note: The hundred rule does not apply to any Washington State Driver's Licenses that were issued on or after September 4th, 2018. We highly recommend that you always check these 10 things when looking over a Washington State ID before you serve or sell alcohol to a customer in order to protect the public and ensure you don’t get yourself and your employer into any trouble with the law! We hope this post was helpful! Stay tuned to learn which forms of identification are considered acceptable for the purpose of obtaining alcohol in Washington State!